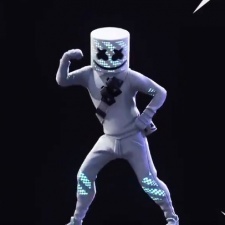 This weekend Fortnite hosted an in-game concert with American DJ Marshmello that attracted more than 10 million concurrent players in the game. The scale of the event comes according to sources speaking to games industry journalist and The Game Awards creator Geoff Keighley. He said that the 10m figure doesn’t include the millions that also watched the concert online. To put the scale of the concert into context, the current Guinness World Record holder for a live-event is Rod Stewart, who performed back in 1993 to 3.5 million people in Rio de Janeiro, Brazil. In anticipation for the event, developer Epic Games laid out numerous in-game posters teasing the gig. During the hours prior to Marshmello’s set, his stage could be seen slowly being implemented near the centre of map. Beginning at 7pm BST, Fortnite players were removed of all weapons before being ushered near the arena to enjoy the festivities. Once Marshmello (real name: Christopher Comstock) took to the main stage the DJ began a 10-minute live audio set of music from his catalogue. On top of this, there was also the opportunity for players to hover or soar around the stage while the music played in the backdrop. After Marshmello’s set ended, players were thrown back into the traditional game, with weapons enabled for all. Epic Games has had a busy few weeks, recently acquiring Agog Labs and 3Lareral in January. The company took home the Game of the Year and Best Developer accolades at the rececnt Pocket Gamer Mobile Games Awards in association with Game Insight. Matthew Forde is a freelance writer from Yorkshire, who's work has been published for Tech Radar, Nintendo Life, Kotaku UK and more. He regularly attends Smash Bros. tournaments, while trying to keep up-to-date on everything pop culture related - particularly superheroes. You can find him on Twitter @Forde999.